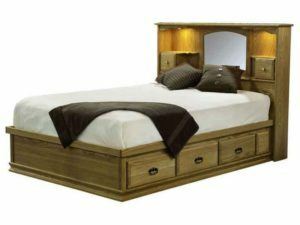 The Country Pier Bed Suite is like a bed, bookshelf and vanity plus two matching nightstands and armoires rolled into one. 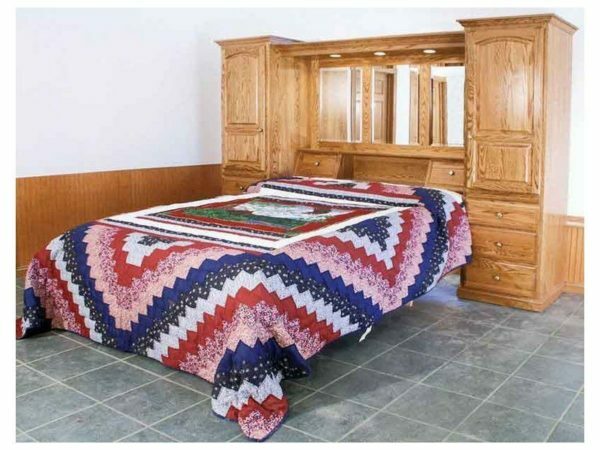 So you could not ask for a bedroom ensemble that’s more grand! Nestled between the drawers and panel door on each side is a convenient pull-out writing board. It’s a great place to rest your reading material, laptop or other devices. Or to jot a note. Also, make sure you check out the touch lights, beveled mirrors, bookshelf/countertop and two storage cubicles in the headboard. 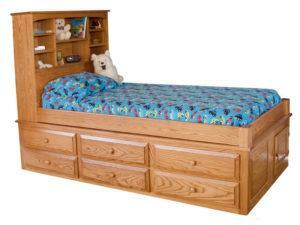 Skilled Amish cabinetmakers custom-build each Country Pier Bed Suite. And they use solid hardwood plus skills handed down from their ancestors. That’s why the suite is so well crafted! In fact, you can expect it to last for generations to come, and increase in value over time. 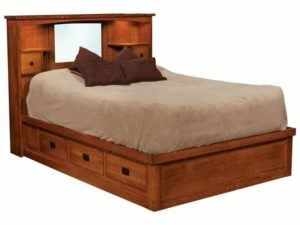 With its modern design and solid hardwood construction, the Country Pier Bed Suite will go well with your existing upscale furniture. 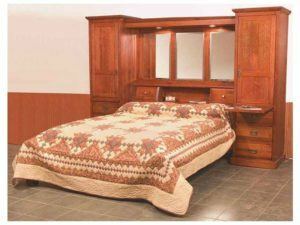 Available as shown or unfinished and in king, queen or full sizes, the bed suite is customizable. Wood choices include maple, cherry, hickory, walnut, grey elm and oak (shown). For a quote, click on the “Custom Options” link. Then, select the hardware and wood species/finish you desire from the extensive selection, as well as the bed size and footboard height. Also, complete the “Request Your Quote” field, where you can tell us your other custom preferences. And if you’re relatively close to Shipshewana, Indiana, visit our store to explore our wide assortment of quality, Amish-built, solid hardwood furniture for yourself.